'Twas the night before Christmas, and time to concoct a winter warmer of blues, as a thank you to everyone who’s found their way here to Blues Enthused, and to all the bands and artists who made it possible. So let’s start by giving it up for Stevie Nimmo, who delivered my favourite studio album of the year with Sky Won’t Fall. It’s got variety, it’s beautifully produced by Wayne Proctor and his House O’Tone chums, but above all it’s emotionally real. The Stevie Nimmo Trio also delivered the goods on the road, and it was a delight to catch them in Glasgow and later Edinburgh, where they were joined at the end of the night by Stevie’s brother Alan. Check out this performance of the mesmerising 'Running Back To You' from his run of Spring UK dates. There was lots of good stuff going on in the middle of the year, not least the visit of Joe Louis Walker to these shores. 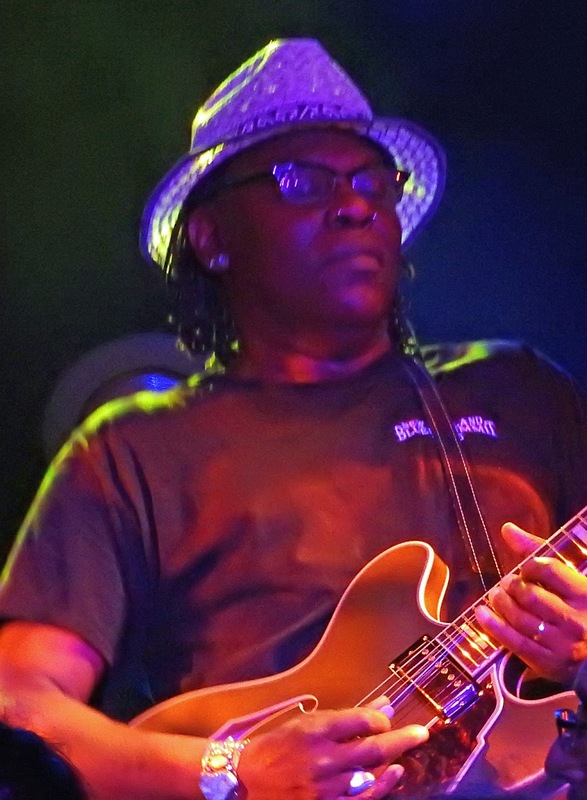 I was lucky enough to be able to do a short interview with JLW, before seeing him deliver a belter of a show at Dingwall’s in London – it was a privilege to see such a premier performer of electric blues, accompanied by his crack band. From the same set of UK dates, here they are playing ‘Young Girl Blues’ during a soundcheck for their gig at The Convent. Joe Louis Walker delivers day-glo blues! which was the set by the Bernie Marsden Band, who rocked the joint good and proper – check out this version of Fleetwood Mac’s ‘Oh Well’, complete with Bernie’s typically humorous introduction. Not content with that, Bernie formed an alliance with fellow Festival performers Safehouse, and returned to Edinburgh for a unique night of Southern rock meets blues-rock under the banner of 'SnakeHouse' that was a blast for all concerned. Here they are doing ‘Trouble’, with Safehouse vocalist Chris Peebles demonstrating that he could give a certain Mr C a run for his money. Let’s hear it for the ladies too, with a nod to American vocalist Sari Schorr. Having paid her dues over the years, Schorr got together with producer Mike Vernon and guitarist Innes SIbun to deliver her impressive debut album A Force Of Nature. They’ve followed up with a lengthy stretch of well-received gigs by Sari Schorr & The Engine Room, which will hopefully reach venues near more of us in 2017. Meantime, here’s a snippet of the album, and some chat from the winning Ms Schorr. Let’s close for now by taking a look forward to the New Year. I didn’t get round to reviewing Chicago blues man Toronzo Cannon’s album The Chicago Way, but it’s an up to the minute take on the classic Chicago seam of the genre, ranging from social commentary in ‘The Pain Around Me’ to relationship humour in the likes of ‘Bad Contract’. Cannon is coming to Britain for the first time in the humour for a short run of dates – catch him if you can. That’s all for now folks, except just for a festive laugh here's David Coverdale reading 'How The Grinch Stole Christmas' - honest! Part 2 of the Blues Enthused Christmas Stocking will be with you soon. Meantime - Merry Christmas! Stevie Nimmo is touring France in February and the UK in March 2017. Sari Schorr is touring Europe and the UK in early 2017.